The chief butler of Yotsuba Zaibatsu. An old gentleman who is very loyal to Alice and can fulfill any of her orders immediately. 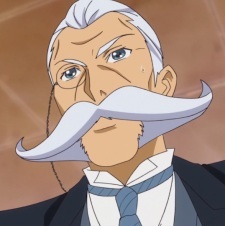 He knows of the Pretty Cure's secret identity along with Alice and assists the heroines in their fights by providing intel and preventing any leaks of their existence to the public.